So as you can see, this last day deception isn't only about the actual mark (please see our MARK OF THE BEAST website to see what the actual mark is). No, there are MANY last day deceptions that will place the people of the world on the side of the beast. And as Revelation 13 states, you will be on the side of the beast whether you have it's mark, or name, or number. Meaning ANY deception of the beast by which you have been made "drunk", will place you on the side of the beast and against the Lord Jesus Christ. So how can we be associated with the 'NAME' of the beast? Well, what is the most important aspect when we are dealing with the 'name' of God? Revelation 14 talks about a special group of people in the last days who have their Father's name in their forehead. And to have this seal in their forehead, it means they have an understanding of the one true God. And this is also portrayed in their worship, character and lives. The most important aspect of the 'name' of God and getting the seal of God is actually worshipping the true God of the Bible. And who is that? Jesus confirms in John 17:3 and Paul confirms in 1 Corinthians 8:6 and 1 Timothy 2:5 that it is the Father (Jehovah). The Father is the one true God of the Bible. And He has a literal Son, who is Jesus Christ, who came to this earth to reveal His Father, the true God to us. This one God, the Father, is clearly portrayed right throughout the Bible. Jesus even stated Himself in John 17:3 that His Father is the only true God. And yet the world worships and promotes this confusing 3 in 1 god of Babylon instead! This is a great deception. And what does Revelation 13 say the name that the beast has on it's heads? 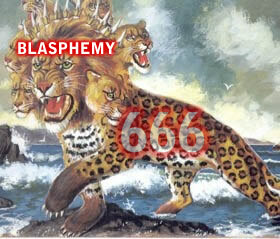 'The name of blasphemy'. And as we know, blasphemy is to make something 'god' that isn't actually God. So to worship and promote the same god of the beast - the false trinity god - is to have the 'name of the beast'. "Be it enacted by the Senate and House of Representatives of the United States of America in Congress assembled, That it shall be unlawful for any person or corporation, or employe of any person or corporation in the District of Columbia, to perform any secular labor or business, or to cause the same to be performed by any person in their employment on Sunday, except works of necessity or mercy; nor shall it be lawful for any person or corporation to receive pay for labor or services performed or rendered in violation of this act ...."
See our page 1890 BRECKINRIDGE SUNDAY BILL AND THE TRINITY for more info on this. So what law on the statute books is in 'direct connection' to the Sunday rest bill? The law that anyone who publicly denies the trinity will be persecuted. And we know that according to Rome, Sunday is directly connected to their trinity god ... "every Sunday is devoted to the honor of the Most Holy Trinity, that every Sunday is sanctified and consecrated to the triune God." (source). Now attached to the Sunday law bill in Ohio, we find the following exemption ... "The proviso of the Sunday law exempts those only who conscientiously observe the seventh day of the week as the Sabbath." (Arguments on the Breckinridge Sunday Bill, [see source above]). So 7th day Sabbath keepers would be exempt. But those who deny the trinity would be punished! Do you see the deception of Rome? Is this going to factor into the coming Sunday law? We will see. But the fact shows that this is not just about the Sunday law, as the trinity god of Rome is closely connected to it. So Seventh-day Adventists who "keep the Sabbath", yet worship the trinity are still following Rome! [By the way, you cannot truly keep the Sabbath if you worship a false god] Remember, you will be worshipping the beast by accepting the mark OR name, OR number of the beast. Now if Jesus Christ is the SON of the living God, then who is the living God? Jesus tells us in John 17:3 ...'And this is life eternal, that they might know thee the only true God, and Jesus Christ, whom thou hast sent.' ... So the true living God is the Father (Jehovah). He is the one true God of the Bible. And it is HIS name that is in the foreheads of the end time saints. Whereas those who worship the god of the beast - the trinity - they receive the name of the beast in their forehead. So the Catholic Church not only calls the 'one true God' - 'Father, Son and Holy Spirit', which the Bible never says. They say this is the most essential teaching of our faith. And it is upon this teaching that the Christian world will UNITE with the Papal Church of Rome. And the whole world is so focused on just the MARK of the beast, they have been duped into taking the name of the beast, which will also get them lost! Who stands on the sea of glass, singing the victory song of Moses? Is it those who simply "refuse the mark of the beast"? No. They are those who get the victory over the beast itself AND his image AND his mark AND his number! They are not deceived by ANY deception of the beast! So who's 'name' will you receive friend? Will you receive the name of the Father - the one true and living God? Or will you receive the name of the beast? The decision is yours, but the consequences are eternal! This is so vital friends! Please study through our TRUTH ABOUT THE TRINITY page and give your worship to the one true living God of the Bible - not the gods of Babylon!